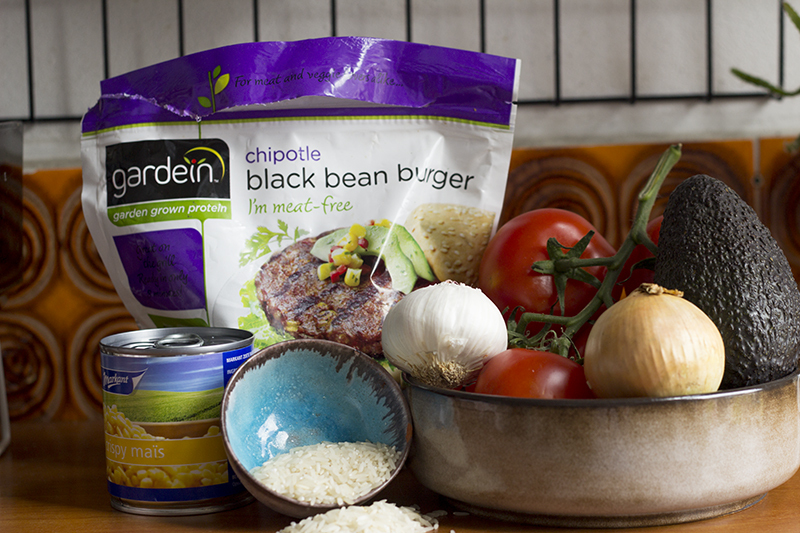 Today we have a double recipe for you, using almost the same ingredients but making two completely different takes on the Gardein black bean burger! These recipes are perfect if you want to use things you already have at home, because most of the ingredients are very basic. However, together they make a wonderful meal! First up, our rice buns burger. With this fun twist, you’ll be using rice in stead of buns. How, you might ask? Take a look! First, cook the rice according to the package. While the rice is cooking, start preparing your salsa. Chop the tomato in very tiny pieces, add the garlic and onion to it (also finely chopped), and then add spices to your taste. We loved the combination of smoked paprika, garlic powder and a bit of curry powder! If you love some heat, you can even add some Tabasco or sriracha sauce. Then slice your cucumber into very thin slices, and cut your avocado. At this point, you can put your burgers in the pan. While they are cooking, your rice will probably be done. Transfer the rice into a bowl and scoop some out with your hands (Make sure your hands are wet, otherwise the rice will stick everywhere!). Make patties from the rice (same size as the burgers), and put them in a hot pan with some oil. After a few minutes, turn the rice patties and let the other side get crispy as well. After you’re done, you can start assembling – et voila! Of course, you can add your own little twist to it such as lettuce or even some vegan cheese. This will be a whole new way of eating a burger! 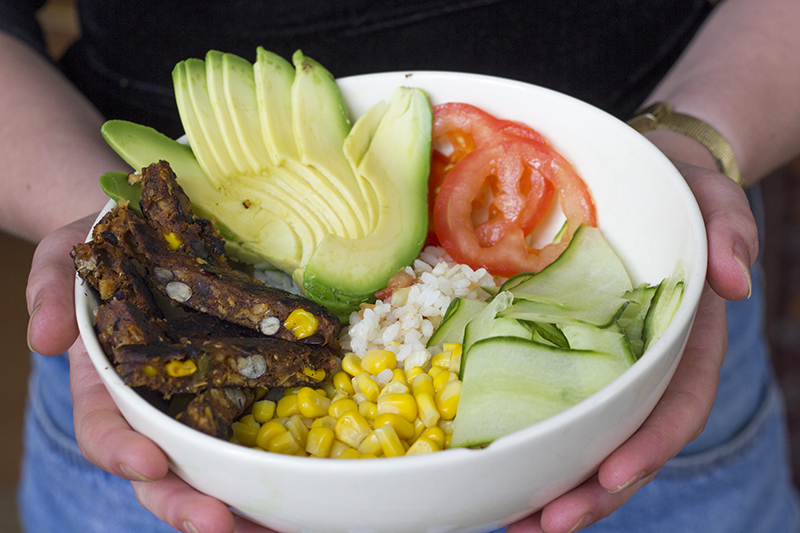 Secondly, we have our Mexican Rice Bowl. Remember we said we would use the exact same ingredients? All you’ll need to add for this one is some sweet corn. Use the same rice as mentioned above, only in stead of making it into patties, mix it with your salsa. This will be the base of your rice salad. Put this mix in a large bowl, and start assembling! Add your avocado, slices cucumber, sweet corn, a bit of extra tomato, and of course – the black bean burger, cut into slices. Add some hot sauce for extra intensity! Enjoyed these recipes? 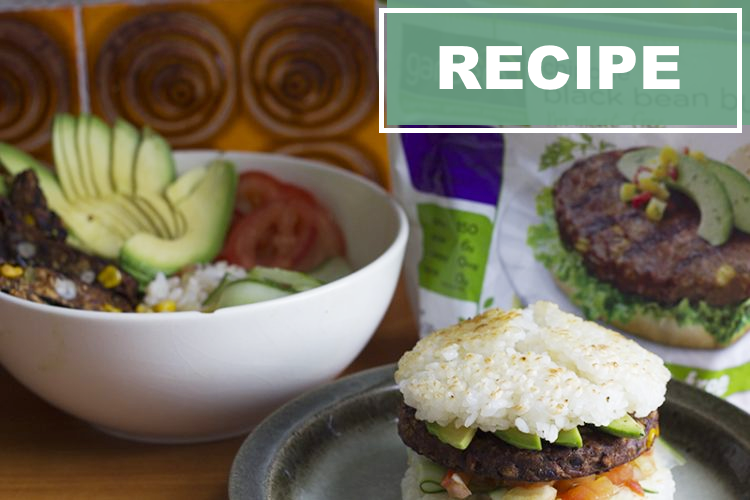 Check out more recipes with the black bean burger here!